NEWS: Jacqueline E. Lawton's Edges of Time to Receive World Premiere production at PlayMakers Repertory Company. NEWS: Jacqueline E. Lawton receives a 2018-2019 Arts and Humanities Grant from UNC to support the research, writing, and development of By Way of Water, an environmental justice play that explores the impact of Climate Change on North Carolina's coast. NEWS: Jacqueline E. Lawton is elected the Dramatists Guild's North Carolina Regional Representative. NEWS: Jacqueline E. Lawton receives a 2018 University Research Council Grant support the research, writing and development of 3 new plays: Blackbirds, Behold, A Negress, and Trinity. NEWS: Jacqueline E. Lawton is selected as a 2018 Faculty Fellowship from UNC's Institute for Arts and Humanities. NEWS: On Stage with the Migration Series - Now on film! ​NEWS: Intelligence by Jacqueline E. Lawton receives Honorable Mention for the 2017 Kilroys; Noms de Guerre received Honorable Mention in 2014. ​​NEWS: Jacqueline E. Lawton receives a Junior Faculty Award from UNC-Chapel Hill in support of her new play, Among These Wild Things. Click here for more. INTERVIEW: Jacqueline E. Lawton discusses theatre, politics and money on NPR's 1A. Click here to listen. ​INTERVIEW: Jacqueline E. Lawton discusses Intelligence with NEA's Jo Reed. Click here to listen. INTERVIEW​​: Jacqueline E. Lawton featured in American Theatre Magazine. Click here to read. 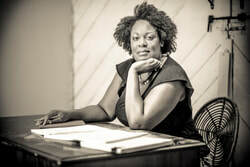 INTERVIEW: Jacqueline E. Lawton discusses theatre and black women playwrights in this Washington Post interview with Lydia Diamond. Click here to read. INTERVIEW: Exclusive Washingtonian feature on Jacqueline E. Lawton. Click here to read. ​APPEARANCES: Click here for a full list of upcoming speaking events. © 2012 Jacqueline E. Lawton.